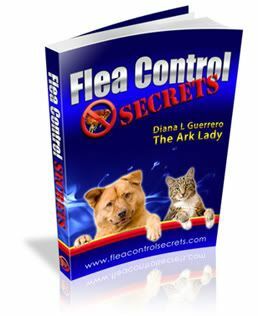 A cat outdoor run or an outdoor cat house are options for the pet lover who just can’t stand keeping their felines inside but who also want their kitties (and other animals) to remain safe while also enjoying an outdoor experience. There are a few different types of cat outdoor runs, cat outdoor enclosures and related items so I’ll give you a brief overview. Cat window perches tend to be inexpensive options (under $50) and provide a platform upon which a feline can lounge and gaze out of the window. Usually they are easy to install and do not require construction skills such as drilling or screwing. Some can be attached with unique fasteners or wood or metal braces. Today there are a variety of options such as hammocks, plush, or carpeted and some even provide heat!. Look for a product that can hold the weight of your kitty(or multiple felines) and that comes with a removable, washable cover. Cat window bays are some of my favorites because they are window extensions that are made of polyethylene or acrylic and extend outside of the window like a swamp cooler or older model of air conditioner. Some designs can expand to fit windows of various sizes so you can move them. The flooring can be made more comfortable with a removable pad and most include venting for fresh air and outdoor odors. These are easy to install and are also affordable (under $150). This product usually only supports one feline at a time. Check to see that the model you consider is weather proof and tested for safety–and check that it will support the weight of multiple animals. Early in my career we just used bird aviaries to construct outdoor cat enclosures. Today these can be custom made, purchased as kits, or you can build your own. Prices vary but you can make them standalone enclosures with entry tunnels or affix them to your home with access via a cat door or window. Additional shelves, ramps, platforms, and other toys or climbing trees can be added along with climbing poles–you can also build these around trees. If you really want to get fancy you might create an outdoor feline habitat that includes elaborate structures and screened patios, decks, sunrooms and more! Many people get creative and include a habitat they can enjoy with their fabulous felines using patios, porches and decks as starting points. In some situations (such as where there is a secure yard) there cat proof fence additions can be added. Most kitties can climb wood, wire, and brick fences but a cat proof fence extension adds an extra layer of protection but there are also those made of netting. These cat fence nets have an advantage in that they keep out strange cats and other animals. Be sure to supervise the first few weeks when your feline is acclimating to make sure it is secure. Make certain the enclosure is cat proof and weather proof. Secure and anchor the bottom, sides, top and entries. Allow access in and out of the house and be sure animals have access to water and shade. Provide scratch items and activity options for exercise and engagement. Tier the enclosure for added space, perching areas, and for room to explore, play, and claim. This cat outdoor run resource is provided for your convenience and a few of the links lead to sites that will share a commission for the referral (and that will help support this blog) but most are simply links to websites offering cat specific products you may find useful. If you want to do it yourself (or if you live in England) check out this How to Cat Proof a Garden article. Purrfect Fencing (USA) is a cat fence system that was actually developed to keep deer out of gardens. 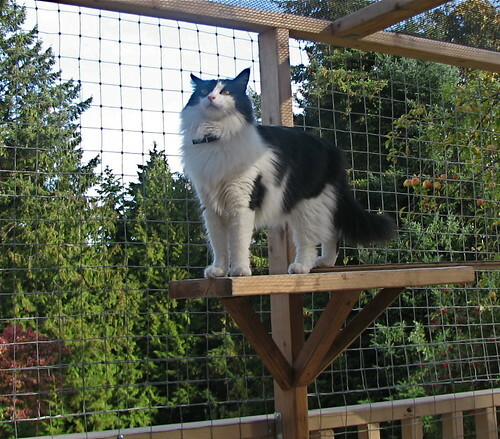 Today this cat fencing allows felines to roam a yard in safety and has a “springloaded” effect. 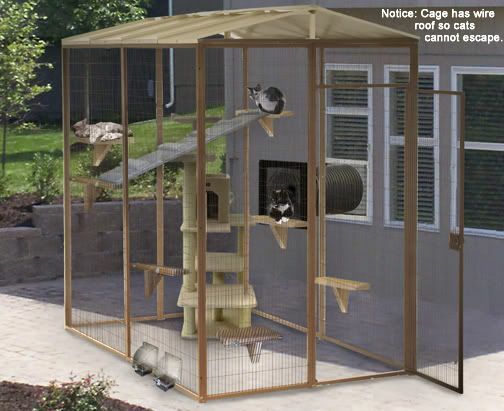 Cage by Design (USA) offers a Suncatcher enclosure which is an outdoor cat house that can be stand alone or connected to the main home via a tunnel. When it comes to a variety of options, Australia leads with the most options with cat outdoor enclosures from Classic Pet Enclosures, Cat Max, Advanced Cat Enclosures, CatNip and Cat Fence In. Habitat Haven (Canada) has outdoor pet enclosures that can accommodate both cats and dogs. There is also the Affordable Cat Fence (USA) but if you are looking for portable play pens for pets you can try the KritterKondo, or cat condos (such as the Feline Funhouse). A newer product on the market is Cats on Deck which allows you all kinds of different options and that ships to different countries. If you know of some other products you think should be listed here please leave your comment below now. Thanks for the quick heads up. My cat likes to stay outside as well. but this is in a different situation because we dont have any backyard here. We live in the 3rd floor. I have a question for you. I see on the photo of the Norwegian Forest cat the wire looks like the stuff I saw today at the local hardware store. I have a Chausie male with a bladder problem and want to screen in a porch at home so that he can also go outside if he wants when he’s healthy. Do you think the wire I saw might work and that he’d enjoy going outisde instead of on the carpet when he’s ill. I’d also have to cut a hole through the house to install one of those pet doors to give him access to the porch. Thanks. No idea as to what you are talking about so I can’t give you an answer to the question. It might help to give him safe outdoor access but I’d discuss the issue with a vet and a local animal behaviorist. You can follow the links to check out the products if you need something prefab.